Yippee, it’s Friday … let the weekend begin! Do you like to have things planned out in advance or fly by the seat of your pants? Personally, I like both … plans and freedom. This weekend is planned … tonight – meet the hubby’s family for burgers and a card game … tomorrow – chores around the house and go to our friends’ house for dinner (bringing an appetizer and my Flourless Double Chocolate Cherry Cookies) and hopefully remember to set the clock back … Sunday will be very exciting (wink, wink) – defrosting the freezer in the garage (ugh!) … when that 30+ year old freezer dies, it’s going to be replaced with a frost-free model. Reality … freezer will probably outlive me! I make such a big deal out of defrosting the freezer … announce it to the hubby many times, insist we “eat out of the freezer” for a week, won’t buy anymore “freezer food”, etc. … truthfully, it’s not difficult. 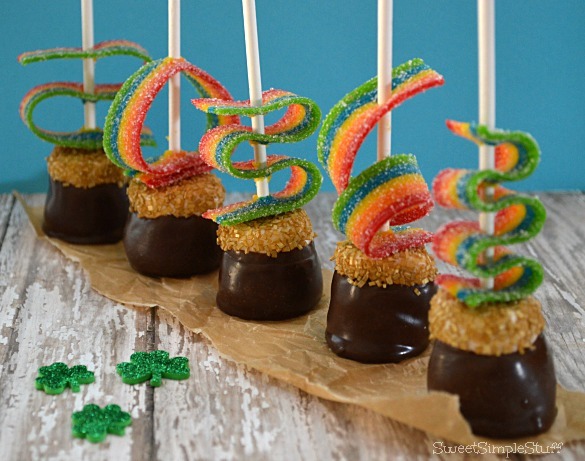 However, it is time-consuming and I’d rather do other things … like make St. Patrick’s Day treats! 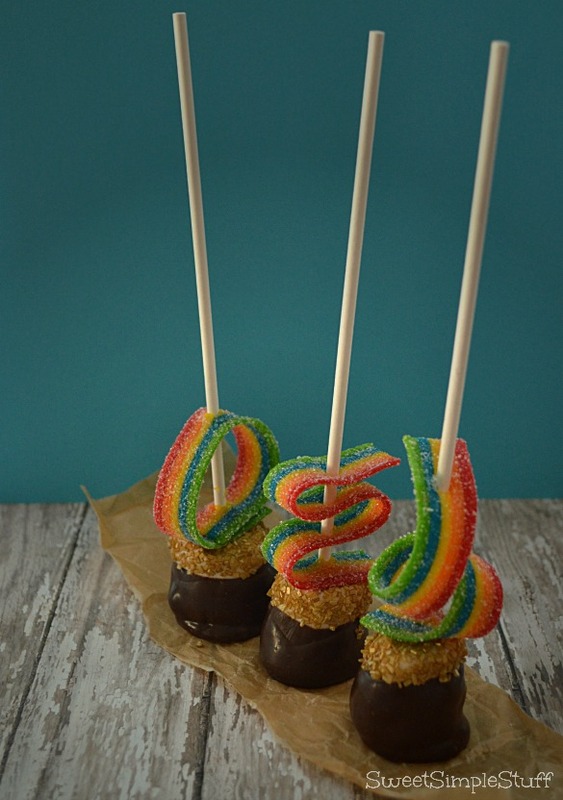 So before I start the difficult job of defrosting … made some Easy Rainbow and Pot of Gold Pops for you! Not only are these pops simple to make, but easy to eat … sweet and sour, soft, crunchy and chewy. Plus, we all know that if it’s on a stick, it must be fun! Did you notice that each rainbow is a little different? What can I say, it was a day of indecision … liked them all … round rainbows, squiggly rainbows and loopy rainbows! 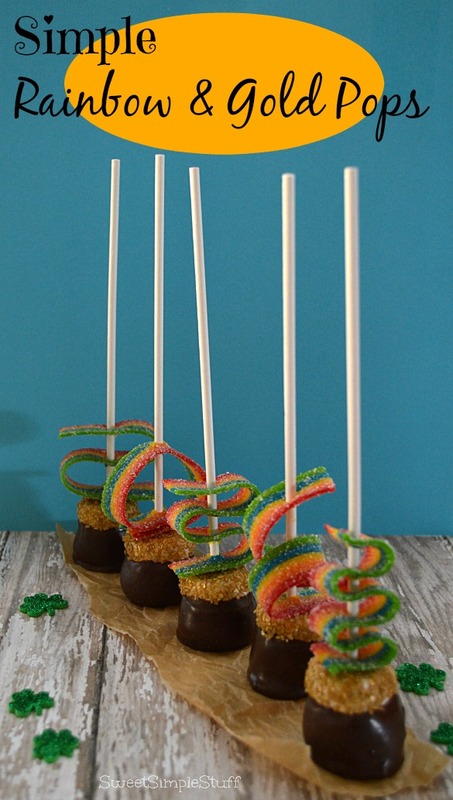 You can make your rainbows any way that you want … no rules to follow here, except that each pop needs a rainbow … oh, and a pot of gold! Line a tray with parchment or wax paper. I used toothpicks in my marshmallows for easy handling. Otherwise my fat fingers always end up in the chocolate … would be forced to lick them, but more than anything … makes a mess. Skip this if you are neater than me. 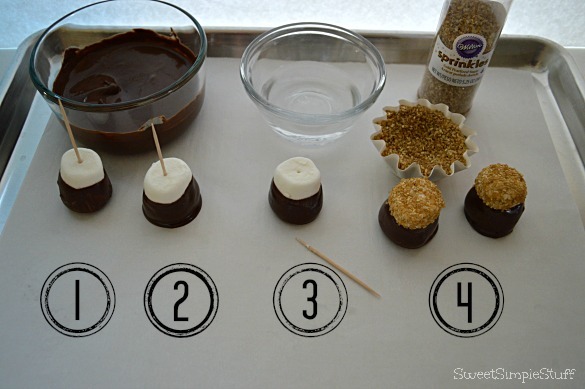 Dip 2/3 of a marshmallow in melted candy, shake off excess, place on paper lined tray and chill for a few minutes. Dip the marshmallow again (yes, it’s OK to double dip in this case), shake, chill. 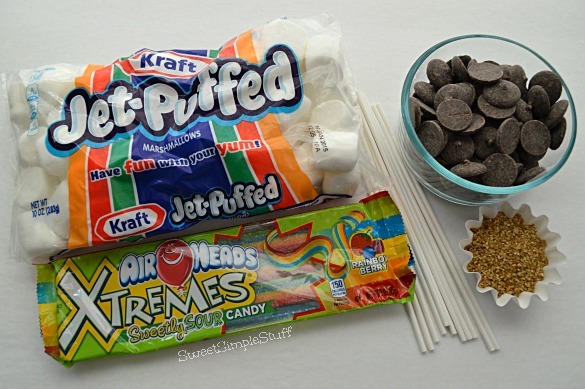 This make the marshmallow appear “more pot like” and adds weight to the marshmallow for balance. Remove the toothpick and dip the “white” part of the marshmallow in water and gently blot excess water with a paper towel. Don’t worry if a little water touches the chocolate, it wipes off easily. Immediately dip it in the gold sugar and let dry. Arrange the Airhead candy in whatever shape/pattern you would like your rainbow to be. Use a bamboo skewer to poke the holes in the Airhead Xtremes, because I found it very difficult to drive the lollipop stick in without this step. You could use anything from your kitchen that has a point … meat fork, turkey lacer, etc. 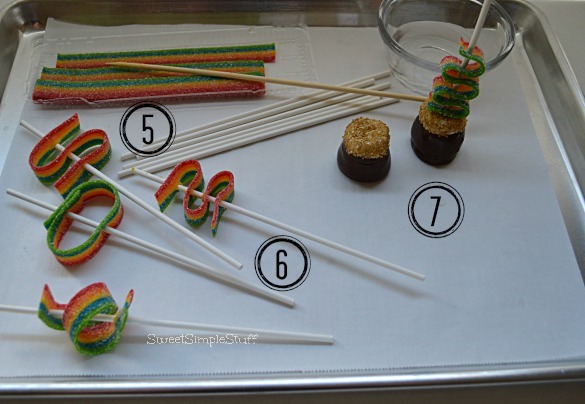 Slide the rainbow onto the lollipop sticks, leaving enough room to insert it all the way into the marshmallow. Dip the tip of the lollipop stick in water and insert it into the marshmallow. Rearrange your rainbow, if necessary. Store in an airtight container until ready to use. I apologize if my directions are a little “wordy” … just passing along what I thought would be helpful. 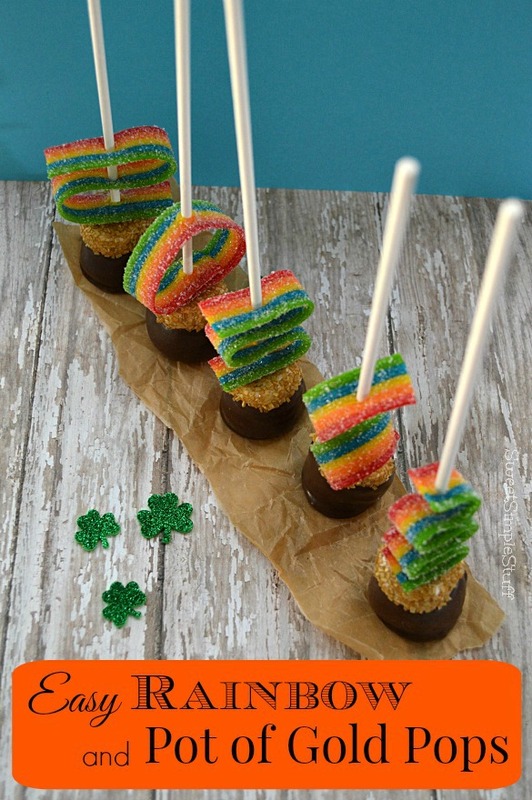 These St. Patrick’s Day pops really are easy and simple to make! The Airhead candies are so colorful … perfect for making rainbows. Are you a planner or do you fly by the seat of your pants? Thank you Lisa 😉 We have the same favorite rainbow … I like it because it’s different … like me! So cute! I love the rainbows! These are just darn right adorable and Oh, so cute as well. I had to read and reread your instructions cause when I looked at the picture I had the thought that you had used 2 marshmallows but instead you only used one. Took me awhile for it to sink in. Guess it’s too early in the morning and not enough coffee yet. I must say; you find the neatest food items as I have never heard or seen the Airhead Xtremes but then I don’t go down the candy isle so maybe that’s why. Have a wonderful and enjoyable weekend.